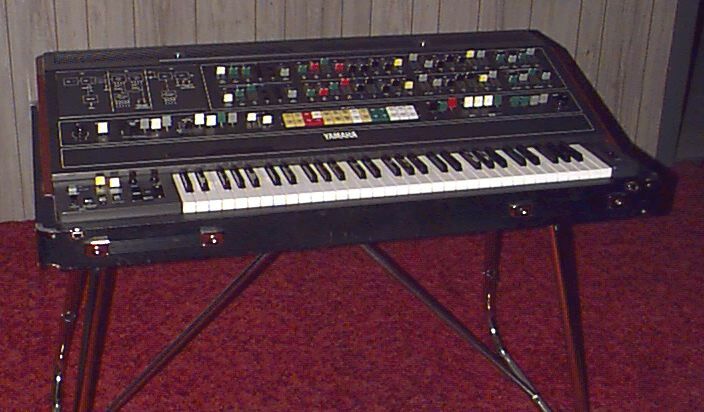 The CS-80 was first produced in 1977 as a commercial version of the larger and more elaborate GX-1. It was popularized in the late 70's and early 80's by a number of pop supergroups, including Paul McCartney and Wings (London Town), Electric Light Orchestra (Discovery) and Toto (Toto IV). 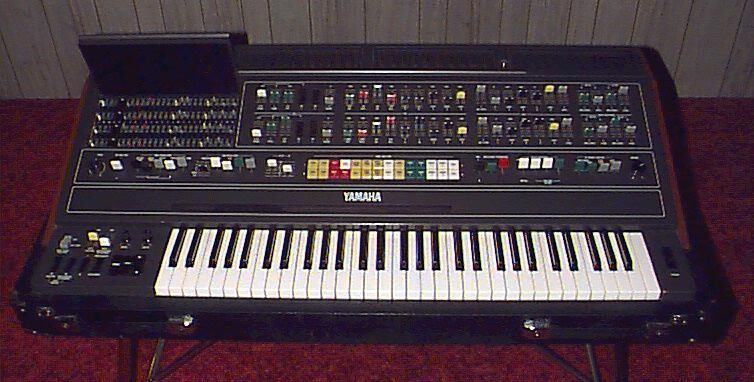 The instrument's large physical dimensions (47.5 X 12 X 27 inches, and a hefty 220 pounds, or 100kg) and excessive price ($6900, or £4950) probably limited its commercial success as it was forced to compete with smaller less expensive synthesizers like the Korg Trident and Sequential Circuits Prophet 5. The CS-80 is much like having two 8-voice synthesizers layered together (a total of 16 oscillators!) and connected to a single velocity-sensitive, 5-octave, 61-note (C-C), semi-weighted-action keyboard. It features a completely analog voice structure. Each voice has a single VCO, both a high-pass filter and low-pass filter with resonance on both, and separate envelope generators for both the VCF and the VCA. The main control panel of the CS-80 slants forward, making room for a multitude of circuit boards underneath along the back of the synth. The main control panel features 3 rows of knobs and sliders. The first one (directly above the keyboard) is for general assignment and voice setup, the upper two rows are for the voice architecture of each of the two available patches. Each of those rows gives you control over a single set of 8 voices (a single layer of the total sound). Each voice includes one VCO, a filter section, and a VCA section, along with four additional sliders controlling its response to velocity and aftertouch. Velocity can be used to control the volume, filter cutoff, and pitch-bend envelope. The pressure can be used to control volume, filter cutoff, Pulse-Width-Modulation LFOs, the main LFOs, and the main LFO speed. The VCO section features a choice of sawtooth, square and sine waveforms, as well as a noise source. There are on/off switches for both the square and sawtooth waveforms and a slider for the noise amount. Pulse-Width Modulation is available with its own LFO. There are sliders for the PWM's LFO speed, the amount of modulation, and the initial Pulse Width setting (from 50% to 90%). The VCO sine wave output is mixed into the patch after the VCF (before the VCA) and is never affected by the VCF setting or the Pulse Width settings. The filter section features both high- and low-Pass filters. Both have sliders for cut-off frequency and resonance. Neither can self-oscillate. The filter section features its own envelope generator, an ADR (attack, decay, release). Both high- and low-pass filters are affected the same way by the envelope generator. There are sliders for Initial Level, Attack Level, Attack Time, Decay Time, and Release Time. Just how these five sliders interact to crest an envelope takes some getting used to. The Initial Level slider does set the initial level of the envelope. However, the higher you set it, the less harmonics are present in the sound (which doesn't quite make much sense). When set in a high position it can be used to create somewhat of a sustain sound, since the decay will not go back to zero. The filters are still reportedly very musical. Their 12dB/octave slopes have a charming character, different than a moog filter, but still capable of doing rich bass sounds (which are enhanced by bringing in the VCO's sine wave after the filter section). The VCA section features a separate slider for the output of the VCF and for the sine wave output of the VCO. The VCA has its own ADSR (attack, decay, sustain, release) envelope generator, with slider for each and another one for overall level. The VCA and VCF envelopes both have a very fast available attack time of (1ms). However, longest attack time available is only 1 second. The release/decay times on both of these envelopes had a range of 10ms to 10 seconds. The LFO section, confusingly named "sub-oscillator", is switchable between Sine wave, Sawtooth waves (up or down), Square waves, noise source, and the external audio input signal. There are controls for speed and three sliders controlling amount sent to the VCO, VCF and VCA. Unfortunately, the single LFO affects both patches equally. This is one of the first things that a CS-80 user gets modified. The speed of the LFO is fast enough for some nice FM effects. Patch selection is quite straight forward. There are 14 available patches for each layer. Eleven of these are fixed, short of changing resistors on an internal board (actually not very hard). The other three buttons choose user defined patches. One button chooses the front-panel knobs (one set for each layer). The other two choose the programmable presets located in a small compartment under a cover in the upper left corner of the main control panel (to the left of the two main patch rows). These are 4 (two for each layer) sets of miniature sliders that are under a fold-up panel These four patches are "stored" by minisliders . . (Yes, even the memory is analog!) Here you will find four complete duplicate representations of a single patch, with sliders for the VCO, VCF, and VCA. So in all there are 22 fixed presets (11 for each layer) and 6 user programmable sounds (3 for each layer). These are arranged on two rows of 14 square push-buttons. The presets are as follows: String 1-4, Brass 1-3, Flute, Electric Piano, Bass, Clavichord 1-2, Harpsichord 1-2, Organ 1-2, Guitar 1-2, and Funky 1-4. Each button lights up when selected. In addition to global control over resonance and brilliance, there are also two sets of global sliders that set the relative volume and brilliance of each end of the keyboard. This allows you to scale the filter and the VCA in both a positive slope or negative slope across the keyboard (quite useful). To the left of the keyboard are additional controls for Sustain, Portamento/Glissando, Chorus/Tremolo, and two buttons controlling the footpedal response. The sustain selector switches between two types of sustain (which is not "sustain" as we know it, but rather affects envelope release). The first setting (I) lets a note decay normally. What is very cool is the second (II) sustain mode . In most synths, you can't have a long release on a polyphonic lead sound because you end up with a blur of notes. In sustain mode II hitting a new key, after letting go of all keys, kills sustaining notes. This lets you play sustained chords and leads together, an effect unknown to any other synth. Sustain can also be turned off and on via a foot-switch (much like a piano's sustain pedal). The Portamento/Glissando switch allow you to select between the two effects. There is also an amount slider. The portamento is polyphonic and can also be switched from a foot pedal. Also in this section is the chorus/tremolo unit that can give various stereo chorus and Leslie-type effects, with a switch that allows you to select between the two effects and knobs for speed and depth. The effects are a bit noisy but very analog sounding and warm. The CS-80 comes equipped with inputs for both a switch and a footpedal controller (like an organ volume pedal). There is a slider controlling the footpedal range and a switch that allows you to select between "Exp" (volume) and "Exp Wah" (volume and filter cutoff). (Note: There is rumored to have been an additional selection planned but not implemented for just "Wah". According to The A-Z of Analogue Synthesizers, by Peter Forrest [published by Susurreal Publishing, Devon, England, copyright 1994 Peter Forrest] "Yamaha were certainly in a hurry to get the CS-80 out there to dominate the potentially huge pro polysynth market: the first edition of the service manual has a lot of hand-drawn pages, including the main panel layout. Interestingly, there was a third button originally planned underneath the Exp/Exp Wah buttons: the legend [in the manual] has been scribbled out, but it was probably Wah. Wonder why they didn't implement something that would have been logical and useful." [Information compiled from numerous sources on the internet including the archives at Hyperreal, and from The A-Z of Analogue Synthesizers, by Peter Forrest, published by Susurreal Publishing, Devon, England, copyright 1994 Peter Forrest]. And special thanks for information from Stefan Gruhl, Jeanie L., and Dean Sparrow.